Okay, NABLOPOMO was not a success this time around. Once I started feeling better, breathing is a wonderful thing, I realized I had so much stuff to do! So my blogging every day here in June sort of like, well, failed. 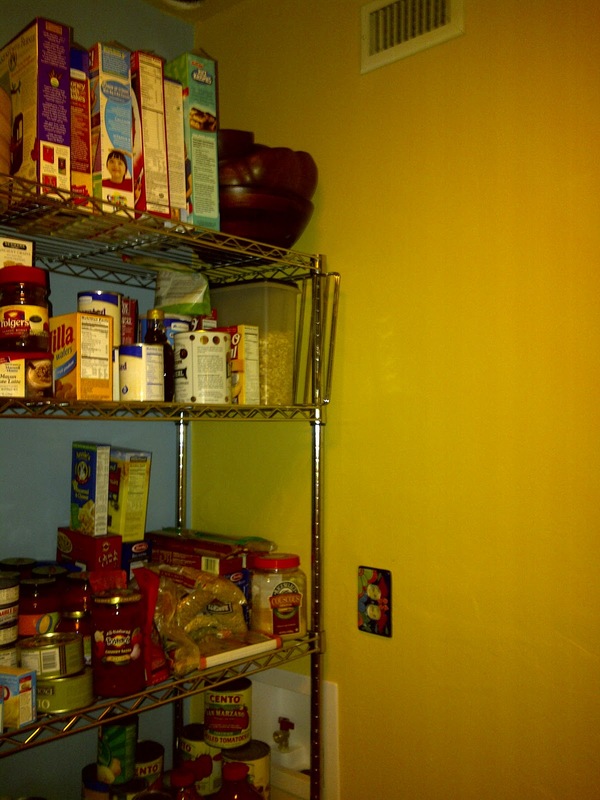 But I have a pantry now! Imagine me doing a happy dance, let your mind fill with pictures of celebration, as those are the only types of pics of me you will get to see. I’ve lost 10 lbs. since mid-May but it is going to take several more tens of lbs. to make me want to post pics of myself. But I do have pics to share with you. First, the “before” and I need to attach a content warning. They are scary! But first, a little bit of a story. Last year I moved the washer and drier from the tiny utility/mud room that is just off the kitchen and opens onto the side yard patio of our home. I had been plotting to do this for years! 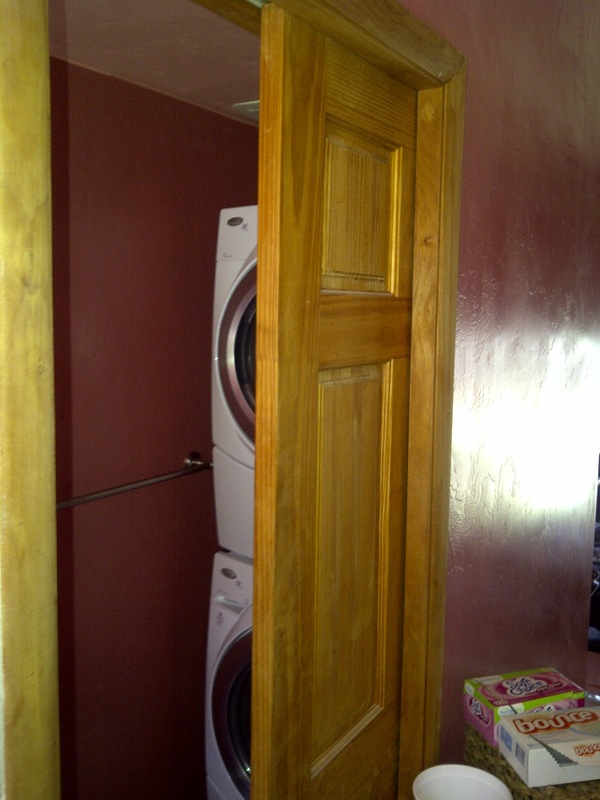 The washer and drier are in a toilet/laundry nook separated from the master suite by a pocket door as you can see to the right. The utility room stood devoid of old washer and drier for months storing only plastic tubs of dog food and dog treats, and a few tools and lots of dirt. 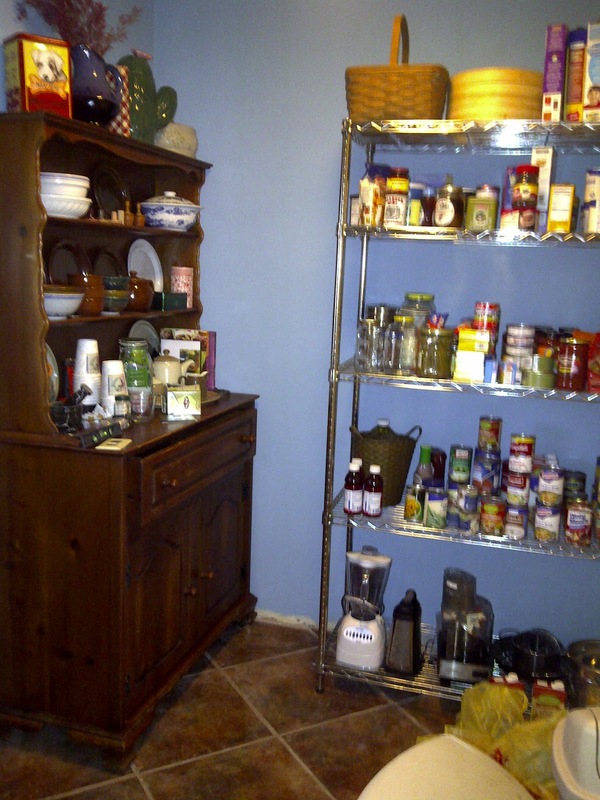 Then at the end of May my hubby and I decided to finally start the remodel on the room and turn it into a pantry closer to the kitchen than the old food storage area. 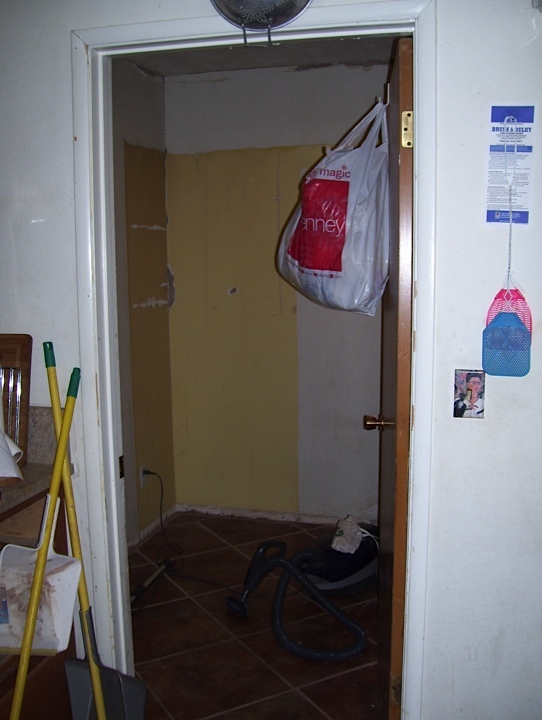 Here you can see the old washer and drier hook-up. And the view of the room from the kitchen. Yech. I did a really good job of emptying out the room, TSP-ing every surface in the room in prep. Hubby did an amazing job of re-plumbing the old washer drier hook-up into a modern version ready to go hook-up in case anyone ever wants to put a washer drier out there again. 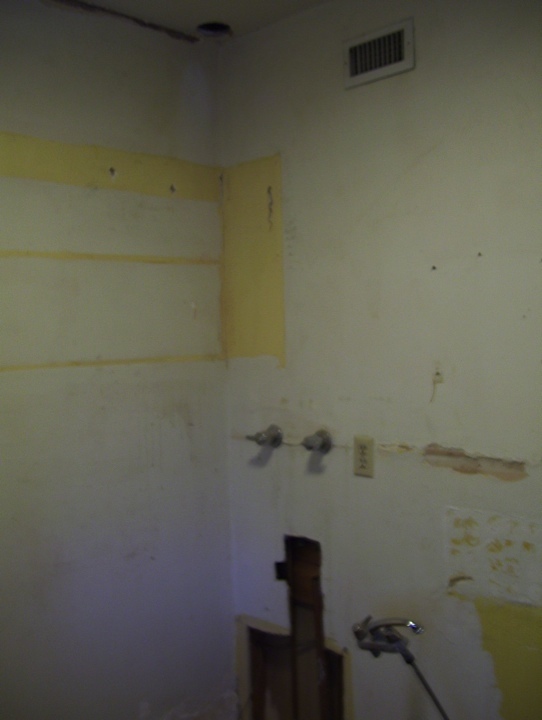 Hubby and I both did a really good job of demolition, and a good job of spackling, up to a point. That point was when Zilla decided her poor old decrepit parents were not doing it right so she took over while I was down and drugged from my septoplasty and she spackled and sanded for days, which drove Hubby bonkers but he was headed out of town for a conference shortly after my surgery anyway so there wasn’t much he could do. So, Zilla and I finished off the room except for the trim around the doors and floor. We will put all the trim in at the same time we install that sort of trim in several rooms that we tiled a couple years ago. I still have to put up curtains too, but I have to hem them first. Finishing off the room included: lots of measuring to see what would fit, spackling, paint prep., priming, painting one wall and ceiling yellow, one wall green, and two walls blue. It also included getting shelves for above the door storage of Christmas ceramics and linens. 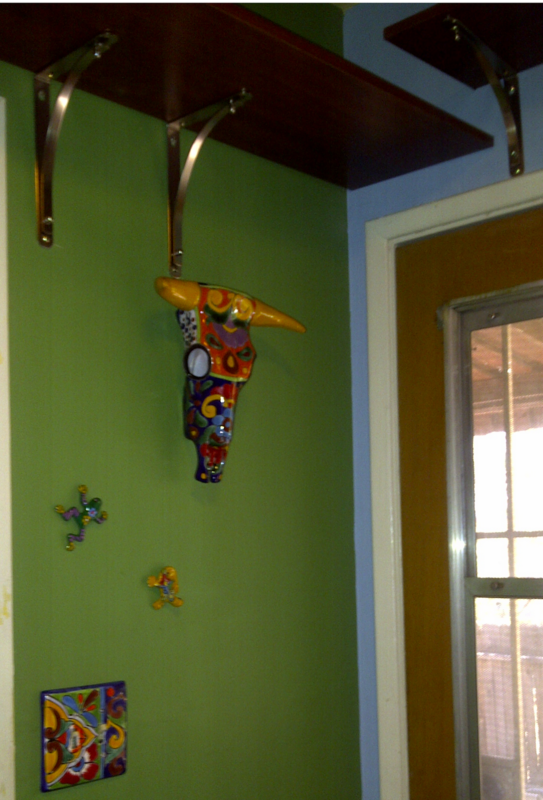 The green wall is now graced by Talavera accents that we purchased at Mi Casa. I cannot speak highly enough of the proprietors who were gracious, quick to help without hovering, and very knowledgeable. If you are in Tucson and want something with a Southwestern or Mexican feel, Mi Casa is the place to go for great gifts and home decor at a reasonable price. I had been dreading the day my husband comes home with a cow skull, which he has been threatening to do for years, as an art piece so I managed to get him a ceramic one that will fill that void (yes, I’m rolling my eyes here) in his life. We celebrated the initial done-ness of the new pantry with a sumptuous Cauliflower Cheese Pie (recipe from The Moosewood Cookbook) that is an hash brown encrusted vegetarian (not vegan) main dish baked in a large pie pan. I made the main dish, zilla created the salad, and we all (hubby included) enjoyed the celebratory dinner. So I did not get posting done every day this month. But I did gain a pantry. I’m happy.